I was under the impression that dry shampoo leaves a layer of white dust on your head after you use it, so I was never really interested in the product. But recently I saw a lot of articles and post about dry shampoo and I became more open to the idea of it. I hate how greasy the top of my head gets on the second day, and I also hate washing it everyday because it’s terrible for your hair, so after reading about how dry shampoo absorbs the oil in your hair and makes your second day hair feel “clean”, I decided to give it a try. 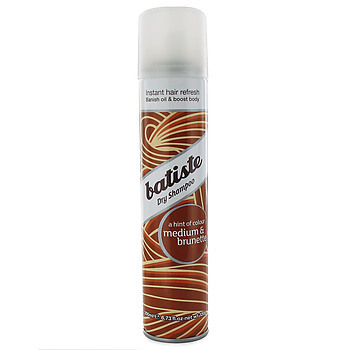 I ended up getting the Batiste dry shampoo for brunettes because it has almost all positive reviews online and it’s very budget friendly compare to the others. And since it’s a product I’m in the process of testing out, I figure something cheap and affordable that won’t break my bank or my heart if I don’t end up using it after the first try is my best bet. Overall I’m very happy impressed by the Batiste dry shampoo. It has a very nice scent that smells really clean and not overwhelming like some of the hair product out there, my hair was also noticeably less greasy but still gives you the “easy to style” second day hair texture you want, and on top of that it does not leave any residue that makes my hair look powdery! I’m very happy with this purchase, and since it’s so affordable I know I’ll be able to repurchase when the time comes without cringing. How do you feel about dry shampoo? Ohh I haven’t tried this one. I usually use rose-scented baby powder, but like the idea of something a bit lighter! You should try it! They smell amazing and have options for different hair colors (they tint the spray so it matches your hair color better) so it doesn’t really leave a white residue!